Q: What factors made you want to develop on this lot ? A: Great location with and opportunity to get into good schools near great transit (including bicycle corridors) with a high walkability factor. Q: Obviously you’ve done some market research. Tell us more about the demands you see and how your building helps address them. A: Much of the new construction in the neighborhood is high end rental, a neighborhood needs to maintain a good percentage of home owners vs. renters for a good balance. There are plenty of people wanting to buy in the neighborhood and our research shows not enough of the new projects are built for home owners. Q: Parking in the neighborhood has become increasingly difficult. What part will this new facility plan in that equation. A: The project is built in a location and manner that encourages walking, bicycling and transit. Our passion is to develop properties in a way that promote lifestyles that are not auto dependent. Q: What are you doing to make the place excellent for those who live/work in your place and those who live/work near it? A: We are creating a quality project that promotes new housing at a price rarely seen in this location which will increase density along the commercial corridor promoting multi-modal transit and additional $ for neighborhood merchants. Q: Have you heard of them? If yes, what featured recommendations are you implementing? A: 41st Ave has been adjusted to add a commercial storefront to the project as the guidelines require and the exterior design and materials are selected based on the Division Design Guidelines. Q: The City now requires inclusionary housing; how many units and at what levels? A: Our projects are a size and scale that do not require inclusionary housing, however, the projects are designed to sell in the 300 to 400K price range that are rarely seen in new construction within these neighborhood locations. Q: If you could change one thing about this project, what would it be? A: We would like to have larger parcels of land for these infill projects while still keeping them to a size and scale that fits well within the neighborhood. A: With the size of the project sites, size of the streets, cars parked on both sides of the street it is likely not realistic or safe that vehicles would be turning around at the site and heading directly back to Division St. Much of the traffic will likely turn at Ivon St. and go around the block to get back to Division St. or Cesar Chavez. I will direct all parties to get back to one of these two through streets ASAP and not to cut through the neighborhood. I cannot guarantee what someone else will do, but I will coordinate contractors to comply with neighborhood concerns as I do with all construction related issues that could be an annoyance or safety hazard to my neighbors. Adam Jones presented his 2 developments in the Richmond neighborhood. Mr. Jones is developing both properties in the high $300,000-$400,000+ range. 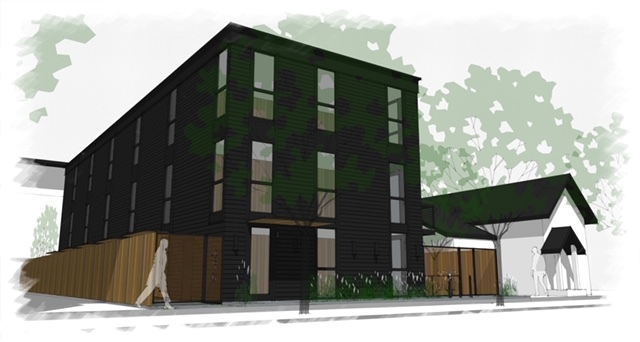 These will both be 6 units, with the 41st Avenue property having commercial space on the first floor ( potentially 2 offices & 4 housing units). The Caruthers property will allow for one unit to be a rental. 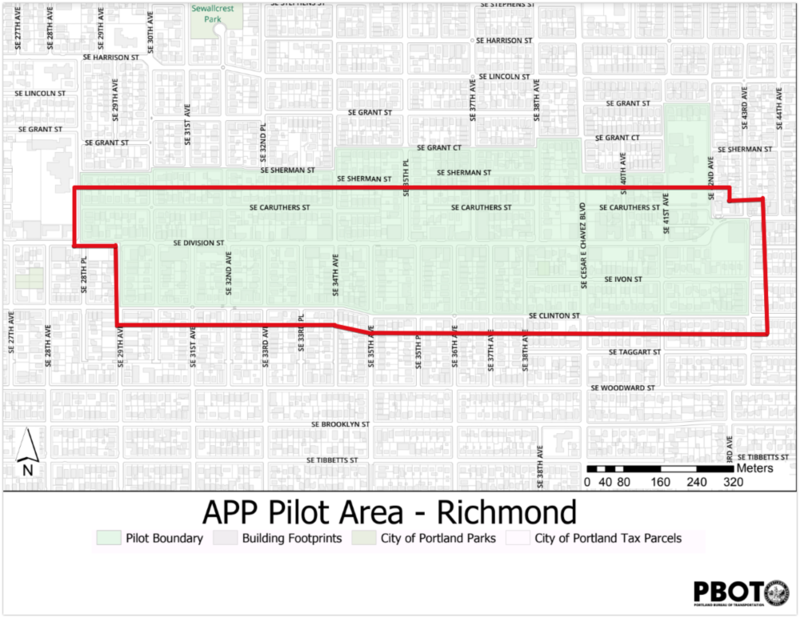 The following is a letter sent by the RNA to PBOTon 2018-04-23 regarding a proposed Parking Permit Program for areas within the Richmond Neighborhood. Thank you for reaching out to the Richmond Neighborhood Association. We appreciate you and your department reaching out to us, and selecting our neighborhood as one of the finalists for trying the new Area Parking Permit Pilot Program. All other borders (East = 29th Ave, West = 42nd Ave & 43rd Ave, & South = SE Clinton) look good for this proposal. Additionally, we would like to verity that both sides of the boundary streets would be included in the program; as it would be all-too-easy for push our current parking problems from one side of a street to the other. Our proposed time to study the streets for spot usage rates would be during the evenings from about 5-9pm, particularly towards the end of the week Thursday-Saturday. The problem is, the city is currently only doing the first pillar—Remove off-street parking requirements—in our area neighborhood. Richmond has added 1000+ units and dozens of new businesses in the past 10 years most of which are providing little-to-no parking, as a result the parking situation has gotten much worse for all residents, businesses, and our guests. We hope that the Area Parking Permit Pilot Program will prove effective at addressing this pillar. But for that to work for our neighborhood, we really need to see some more in relation to the third pillar. We really need people to see that the money being raised isn't just disappearing into some general fund. We therefore request that, any funds raised by this program—beyond that which it requires to administer—are directed equally back into the Richmond Neighborhood and into a sister neighborhood with higher need and fewer resources. This point is critical to the success for our neighborhood long-term, will be critical to gaining enough interest to even adopt the program in the first place, and can help to address some of our area's historical inequities. While the Richmond Neighborhood Association's top choice for an Area Parking Permit Pilot Program in our neighborhood is along Division. We ask that PBOT consider adding the block South of Hawthorne between SE 32nd and SE 43rd as part of an Area Parking Permit Program should PBOT decide to work on Sunnyside's Option A. Thank you again for your work so far, and we're looking forward to working with you on this project in the months to come. How long until they demolish my house? This article originally appeared in the January 2018 Richmond Neighborhood Newsletter. A major concern we hear frequently in our neighborhood forums is “when will we stop demolishing Portland?” That got me wondering, when will we run out of things to demolish? Or even more pertinently, when will my house get demolished? How many homes are demolished per year in the neighborhood? How many homes are there in the neighborhood? Piece 1: How many homes are demolished per year in the neighborhood? Fortunately we live in a city that does a great job of making information readily available online. You can search the city’s main website for property-related info at www.portlandmaps.com, then select Advanced » Permits, to find the number of demolitions that have occurred in our—or any—neighborhood since about the year 2000. For the purposes of this exercise I used the data since the latest census in 2010. From the results for this search we can see that since 2010 there have been 54 demolitions of single-family residences, and 2 demolitions of triplexes; meaning that a total of 60 housing units have been demolished in the past 7.75 years. On average there are 7.7 housing units demolished per year in the Richmond neighborhood. Wow, that’s less than I expected. The poison is in the dose though, so to know how bad anything is you need to know it’s concentration. Piece 2: How many homes are there in the neighborhood? Now we know there are 7.7 housing units demolished every year, but in order to understand the impact of that number on our neighborhood, we need to know how many total units there are in the Richmond neighborhood This one should be easy to answer; all I have to do was find census records that break things down by neighborhood and I should have my answer. The Office of Neighborhood Involvement (ONI) is the bureau that most likely would keep such records on hand. Doing a search online for ‘portland census oni’ quickly finds the exact data I need (https://www.portlandoregon.gov/oni/article/376015). As of 2010 there are 5290 Housing Units in Richmond. To determine this I divide the total number of housing units demolished by the total number of housing units. That shows me that each year only about 0.15% of the homes in our neighborhood are demolished. Not bad. But that doesn’t tell me how long until MY house is demolished. To get this answer all I need to invert the odds to find out how long the typical home will last. And how long is that? 683 years. That means—odds are—my house won’t be demolished until the year 2700...I think I have a bit of time. Development: Multi-family residential building (unknown sq ft). 32 residential units. The RNA Land Use & Transportation Committee Chair tried to reach out to the architect for the project Armin Quilici of Q U A D.
A: Housing at this location will complement the existing multifamily and commercial uses along SE Division that make it such a desirable place to live. A: There is a strong demand for housing throughout the city and especially in neighborhoods that have good access to shopping, transit, schools, parks and other neighborhood amenities. There is also a demand for affordable housing, which this project provides. 5 of the 32 units will meet new affordability requirements. A: This project does not provide parking. The project does have good access to transit. Providing parking on small lots along SE Division St would impact the pedestrian experience. Q: You are in a commercially-zoned property. Are you building any commercial space as part of your property? A: This project does not provide commercial space. The role of this building is to be in the background and reinforce the urban fabric of SE Division. Even without commercial spaces, the building design reinforces the hierarchy of the ground floor. Units are designed to maximize light and air. The massing is broken down into two volumes to reduce the building’s overall scale. The first two floors of the building along the sidewalk are articulated in such a way that ‘reads” as a tall first story. The building steps down on the south side to the residential zone. The transparent lobby and building entrance is protected by a canopy. The primary exterior material will be brick. Accent materials will include wood siding and metal panels. The façade articulation is simple and responds to the layout of the building. A: We are providing 5 units (one 1-bedroom and 4 studios) that meet the requirements for inclusionary housing. One will be on each floor. A: I would like the zoning code to allow for a greater variety of exterior materials that might include some types of corrugated metal panels. There are high quality corrugated metal panels available, which are currently not allowed along the SE Division Street Corridor. A: I will review these concerns with the contractor. I do not envision them utilizing smaller neighborhood streets to get to the site, which is on SE Division. Q: Can you send us color renderings of the site? Ideally in context to the surrounding area. Q: Can you send us floor plans for the site so that folks can see the general layout for the building? Q: For your similar project next to Pok Pok (3212 SE Division) we requested that 3 of the units facing Division be turned into live-work spaces—akin to what you see at 440X SE Hawthorne—so that we can retain commercial vibrancy on our corridor. Tell us more about your plans for commercial ready units in this prime commercial location. A: The project has basement level residential units which are partially below grade. The layout of the building does not lend itself to residential units that are easily convertible to commercial space. The RNA Land Use & Transportation Committee Chair had a chance to talk about the project with the developer Adam Jones. Q: What factors made you want to develop on this lot? A: We have a great passion for the SE and Richmond is a favorite neighborhood. I am a bicyclist and the property fronting on 41st Ave, lying between Clinton St. and Lincoln St., all great biking corridors is a big draw for this project. Richmond Elementary’s Japanese Immersion program and the newly remodeled/expanded Franklin High School are excellent, not to mention all of the great shops, restaurants and café’s within walking distance (looking forward to the addition of Green Zebra!). Q: Obviously you've done some market research. Tell us more about the demands you see and how your building helps address them. A: With the great stress on housing in the City, projects that are located along commercial corridors that can assist in adding density while allowing the residential neighborhoods to maintain their character are key. Demand has been growing and continues to grow for housing in “walkable” locations. Development of owner occupied properties in those locations has lagged behind rental properties and we want to be a part of the solution for filling that gap as ownership assists in neighborhood stabilization. Q: Parking in the neighborhood has become increasingly difficult. What part will this new facility play in that equation? A: I see many properties developed in which bicycle parking appears to be an afterthought to meet code. We are working to create “bicycle garages” as part of our project. A: We are not building any commercial space as part of this project. A: Besides making sure our project has a nice connection to the street, we are working on a “green wall” to add a touch of nature and greenery to the project’s street presence. Q: What featured recommendations are you implementing? A: We are working through many design details and will send drawings that show those details and/or bring them to a requested meeting for neighborhood review. A: There is no inclusionary housing required or to be delivered within this project. Q: If you could change one thing about this project what would it be? A: We attempted to increase the size of the project by purchasing the saw shop on the corner of 41st and Division St. and would have loved to have done so. Q: Will you agree to direct all your subcontractors with large trucks (dump trucks and semis) not to use adjacent neighborhood streets and to use SE Division to get to main thoroughfares? Would you be willing to sign a good neighbor agreement with the RNA to guarantee that? A: While many trucks coming to the site will not be able to turn around on 41st Ave and will need to go to Tibbets or the first street they can turn onto based on the street that particular day, I agree to direct all contractors with large trucks (dump trucks and semis) to use adjacent neighborhood streets to get back onto SE Division as quickly and efficiently as they can and to use SE Division to get to and from main thoroughfare. I’ll work to be a good neighbor and to keep contractors and material suppliers in compliance with the request to limit their traffic on the adjacent neighborhood streets. Q1: Can you send us color renderings of the site? Ideally in context to the surrounding area? Q2: Can you send us floor plans for the site so that folks can see the general layout for the building? A: The architects are working on drawings that will be available on or before a requested meeting date. I will send the drawings when available whether a meeting is requested or not. At the March 12th, 2018 RNA General Meeting we discussed the results of the RNA Land Use & Transportation Committee meeting where they key topic was the BPS's Better Housing by Design Project - Draft Discussion. After presentation, discussion, and debate the RNA Board voted 10-3 to approve and send this letter to the Project Leads, Head of the Bureau of Planning and Sustainability (Mayor Wheeler), and other relevant parties. The RNA would like to thank Bill Cunningham and his team at BPS for having clear materials that are easy to follow. Such clear, simple, and well-defined documents, images, and renderings were a boon to our community’s ability to review, process, and agree to support of the following points. The RNA Supports the following recommendations as-written..
1. Regulate development intensity by the size of the building, instead of numbers of units. 2. Require higher-density development to include visitable units. 4. Provide incentives for preserving existing affordable housing and trees through transfers of development rights. 8. Allow alternatives to conventional landscaping. 9. Limit large surface parking lots and asphalt paving. 11. Limit garages to no more than 50 percent of building street frontages. 12. Require building entrances to be oriented to streets or to courtyards. 15. Require building height transitions to single-dwelling zones. 20. Strengthen minimum density requirements. We request that outdoor or green space requirements be the larger 48 sqft for all sizes of properties. 7. Require shared common areas, such as courtyards, for large sites more than 20,000 square feet. We would like to see more parking permit programs or zones to better prevents the current tragedy of the commons occurring near dense residential and commercial areas with street parking. 13. Require front setbacks that reflect neighborhood patterns and limit privacy impacts. The proposed standard doesn’t seem flexible enough. Perhaps have different standards for RM-zones that are interior to a neighborhood vs. those that are on transit corridors. 14. Simplify side setback regulations and reduce barriers to development on small sites. Allow for zero side setbacks on sides adjacent to other RM-Zones or Commercial Zones provided that green space is then used elsewhere in the project. Would like to see the requirements reduced from 100’ to 50’; meaning 50’ frontages wouldn’t need a notch, but anything larger would. While the RNA supports affordable housing for a more economically diverse neighborhood; opinions differ greatly on how to get or enforce affordable housing. 21. Require transportation and parking demand management approaches. While we like the idea, it should be for a longer term and more than just bus passes. Or we should approach parking strategies better to prevent abuse of free parking and let the markets decide how to get best incentivize people to live in units without parking. Recognizes the project is in the early phases, and would appreciate Bill Cunningham and his team presenting the topic to the community to learn more about the project before sending a letter. Thank you for all your hard work and outreach regarding the Better Housing by Design Project. And thank you for considering our requests. In February 2018 for the RNA General Meeting we had PBOT come and present to us on the Lincoln-Harrison Neighborhood Greenway. After their presentation we broke into smaller groups—each led by a member of the RNA Board—where we discussed the project in details and came up with each group's top questions about the project. While PBOT only had time to answer 2 rounds of questions during the meeting, they promised to answer all the questions collected from the groups. And PBOT's staff has kept true to their word and responded to all the questions from our various groups of members. Thanks again to all who came out for a productive and detail-filled meeting. Each of the 7 groups in the meeting had ~5 prioritized questions. Those were given to them in rounds. Each group got their top question answered, then the next, and then subsequent rounds were collected and sent to PBOT in addition to the original questions. While PBOT's response shows a linear list of questions it's actually a collated list of prioritized questions from each group. The Richmond neighborhood Association Land Use & Transportation Committee Meeting will meet at Genies Too (4800 SE Hawthorne) from 7-9pm on Thursday, March 8th, 2018. Discuss the project as it relates to our neighborhood, bring forward to the RNA General Meeting areas we like or parts we think could use improvement. To help get a feel for where people in our community are at on this topic, please fill out this survey: Survey - What's your opinion of the Better Housing by Design Proposals? During the December RNA LUTC Meeting we met to discuss the latest updates for the Residential Infill Project and what some of our thoughts, concerns, and praise for it was. We went through the proposed draft items sequentially and recorded the questions as best we could as they came up. And were fortunate enough to have Marty Stockton from BPS in attendance to answer many of our questions. Below you’ll find an overview of what we discussed that evening. 1. How can we better alert residents to projects that are in play like RIP? 2. Where can I find information for projects on vulnerable communities? 3. Who if any community members were consulted? 4. Will the process create gentrification with the RIP overlay? 5. Are there specific density goals for Richmond? 6. Can we structure requirements to improve process? 7. Are there incentives for relocating houses? 8. Are there incentives for relocating overhead electrical services to underground? 9. How could developers take advantage of RIP? 10. Why just one proposal on residential infill in lieu of 2 or 3 and why now? i.e., process/project fatigue/saturation. 11. Are there fee waivers for conversion of existing houses? 12. If conversions are used for AirBNB can their fees/taxes be assessed at “market rate”? 13. Does basement and attic square footage count towards FAR? 14. How can we see the worst-case outcome in advance to understand what we’re getting? 15. How can we make an FAR for entire parcels? i.e., larger ADU if under overall FAR for parcel. 16. Can we have a future discussion on tiny homes? i.e., how do tiny homes fit in with the big picture and how can we keep track of this topic? 17. How is the lowest point determined- can the point be manipulated by piling up dirt/moving dirt around? 18. How can we make our slopes work for us? 19. Why increase the front setback from 10’-0” to 15’-0”? 20. Can there be more context-based rules? 21. Was consideration given to height being context-based? 22. What is the objective for the limit? 23. What does the amenity bonus allow? 24. Will this be done by homeowners versus developers? 25. Is creating affordable housing a goal? 26. Is demolition being incentivized? 27. Are there loopholes which will allow 4-6 units? 28. Do we need this density- have density goals already been met in some areas? 29. Do we want different housing opportunities in our neighborhood? 30. Are there incentives for encouraging waiving SDC fees for conversions? 31. Are there any conversions being “condo-ized”? 32. How can incentives be created for long term rentals? 33. Have there been studies of where the ‘a’ overlay will likely happen? 34. Will there be an equitable distribution of neighborhoods benefiting from the overlay? 35. Is there a way to incentivize to favor home owner’s over developers? 36. How is infrastructure being addressed- is it? 37. Can more parks be added? 38. Can incentives be created for areas that meet development standards? 39. How does low income housing work (80% MFI) with rental versus ownership properties- is there an affordability bonus? 40. Can design be regulated to have minimum impact on adjacent home owners- are there policy tools being used for analysis? 41. How many SF are allowed- how does FAR work? 42. Can multifamily dwellings be created in single family dwelling zones? i.e., creating the missing middle. I got a great question from a local resident, that I thought would be worth sharing with the neighborhood about moving a home. A friend told me that someone presented at the Richmond Meeting, quite some time ago, about a home near Division. They were interested in finding a way to move off the site, rather than having it demolished. I'm interested in doing what I can to preserve affordable housing in Portland, and have a site the home could potentially be moved to. Any assistance you can offer in getting me in touch with the owner or whoever it was that came to the Richmond group would be greatly appreciated. Moving homes is a great way to preserve some classic existing homes while also making space for new development. I find it fascinating that it's something we used to practice all the time, but it's been basically abandoned as a practice since about WW2. A great example of how common it was is the great Raising of Chicago, where they raised entire sections of town by over 6 ft! There's even a lot of local examples where the old deed is for a very different address, and some research can show that your house made quite the move. Or even some more recent examples would be the Phelps-Montgomery House on Hawthorne or the Morris Marks House in Downtown. Sometimes the owner lives right there. Other times it's a rental from a local person. And sometimes it's an LLC or other shell company that makes it really hard to track down who actually owns the place. It goes without saying that you'll need to fully work out any deals with the owner before moving their house. I have a little experience with moving houses myself, as I had to raise my house to replace a crumbling foundation. There's not a lot of games in town, but the key companies are going to be Emmert International in Clackamas and Northwest Structural Moving in Scapoose. In fact both locations even have used-house lots where you can find a classic home and they can bring it to you. This can get a bit messy. It's probably a step that the moving company will handle, but a few things you should know. Every intersection where the power or other lines are low will require the various utilities to come in and raise those lines. Sometimes this can require temporarily disconnecting things. This can get really pricey really fast, and is the main reason why few people move homes. Even a simple move of a few blocks could cost 10s of thousands. Fortunately in your case, that house is rather short, so maybe not too much lifting if they can put it on a low-ish trailer. But you might also have to cut some trees, so expect to get at least an arborist to make sure there's a clear route. The city is pretty challenging on cutting our tree canopy though, so this might also be an uphill battle, but if you love the place, it's worth looking into it. Sounds like you've got this part covered. But just in case, if you're wanting to put it on an existing lot then you could be subject to all sorts of Single-Family Zoning rules. The house you're looking at is over 800 sqft, which means that it would be too big to be allowed to be an Additional Dwelling Unit (ADU). If you're in an R2.5 zone though, you might be allowed to lot-split your present lot though and create 2 single-family home lots. But the particulars of that could get interesting. I'm sure people in the city would be really happy to help you out though. At the end of the day most of them love our older homes and would love to see more of them preserved in this fashion. If you're still interested, let me know what you find out. While I've only lifted and lowered my house to preserve and secure the home. I've had some friends out-of-state move their mid-century house and it's now lived in by a family a few dozen miles away. It's quite the ordeal and usually done in a single night, but I think it's a really worthwhile re-use of our existing housing stock. Best of luck, and let me know if you have any further questions! Development: Multi-family residential building (approx 44,053 sq ft). 54 residential units with Ground floor retail, 11 parking spaces. The RNA Land Use & Transportation Committee Chair had a chance to talk about the project with Urban Asset Advisors' VP of Project Management, Seth Henderson. A: This lot is next door to our Theory 33 project that is currently under construction. When the opportunity came up to acquire the lot next door and finish out the development of this lot we couldn’t pass it up. From an architecture standpoint it gave us the opportunity to positively impact the design and street feel of this key stretch of Division while also providing high quality housing that is in great demand for this outstanding location along Division Street. A: Division has built itself out as one of the top retail/food corridors in Portland. This has driven the demand for people wanting to live along Division and also the demand for retailers wanting to be a part of this great retail energy location. A: The project provides (9) structured parking spaces. A: The project will provides a total of 2,541 sf of leasable commercial space, separated into (2) tenant spaces. Location of parking entry and building services is minimized along the street to maximize active storefront space and maintain pedestrian safety. Massing is broken by central retail/entry courtyard to continue pattern of mid-scale façade widths, and extends the feeling of SE 33rd Ave as a public space. Increases visual continuity of the main street corridor by continuing the 13’-11” ground floor height of (2) adjacent developments to the East, and holding the building face at the property line. Increases access to public gathering via the central courtyard, and a semi-public patio at the North. Compatible materials – single material, with variation, interest, and articulation through natural material and constructed detail. Façade articulation – meaningful, program-responsive window pattern, with mid-scale shadow-lines at each floor and apartment stack. Transparent building lobby , mail, and bike room to extend the courtyard through the building to the North landscaping. A: We are providing (2) units, both on Floor 2. One will be a 3-bedroom/2-bath , the other will be a Studio. Both will meet requirements for Type A accessibility. A: Remove minimum parking requirements along Division projects to allow for maximum active storefront and pedestrian experience. A: Means and methods of construction are not dictated by the standard A102 contract, and the developer takes on additional liability by dictating these terms. We endeavor to minimize impact to the local community during construction execution, and would be more than willing to require our general contractor to participate in a discussion with the RNA to hear concerns and brainstorm on solutions. The same general contractor is currently executing our Division33 development; have you received any complaints regarding this project execution? We have been in constant dialogue with our neighbors on the west, east, and north, have not had any noise, dust, traffic complaints in the public right of way. ‘DIVISION TWO’ is a planned 45,000 sf, 4-story mixed-use building located at 3305 SE Division. 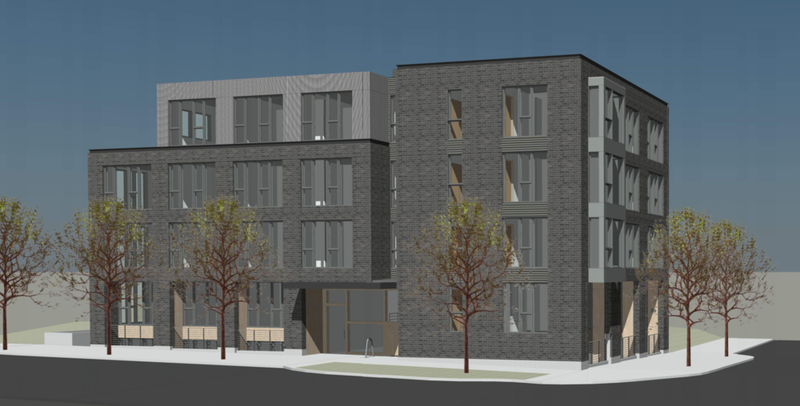 The project will provide (54) for-rent apartment units (a mix of Studios, 1-bedroom, and 3-bedroom units), and 2,541 sf of leasable commercial space at the street level. All apartments will be accessible (ANSI 117 Type B and Type A units). Structured parking will also provide (9) on-site parking spaces. The project is a modern building, which utilizes existing compatible architectural patterns, and timeless design tools, to complement the existing context and Special buildings of the district. Specifically, the design focuses on façade width, differentiation of the street level, reinforcing an active pedestrian environment, façade order, and variation and shadow within a singular natural material. The property is located in an uninterrupted block on the North side of Division, between SE 32nd Ave, and SE 34th Ave, with SE 33rd Ave terminating at Division in the middle of the property. The design team recognized what is essentially a ‘superblock’ as incongruent with the scale and pedestrian-oriented goals of the district. Therefore the design utilizes a central, shared retail and entry plaza to effectively split the building massing – repairing the block structure at SE 33rd Ave, and reinforcing a pattern of building façade widths similar to the neighboring 4-story developments to the East (3319 under construction; and Salt N Straw building). The plaza also continues a successful typology of active, off-sidewalk pedestrian spaces which differentiate the character of SE Division and the neighborhood. The building design utilizes timeless design tools of urban architecture to reinforce an active pedestrian street front, and activate the upper floors with Juliette balconies, and shadow. The ground floor is articulated with a taller ceiling height, larger storefront window openings, and entry canopies. At the courtyard edges, the building above cantilevers over providing added weather protection to seating areas in the courtyard. At the upper floors, the façade is organized by a shadow -line at each floor and apartment unit, created with a light sheet-metal reveal. A subdued window pattern reflects the rooms, and layout of the apartment units. The façade complements contextual buildings by providing great variation, shadow, and interest in the specification and construction of a single natural material. The primary material stained tight-knot cedar siding, is installed in varying depths and spacing. The resulting variation of shadow provides a tactility and grit which reflects the eclectic and dynamic character of the existing neighborhood architecture. Streets with low traffic volume and speed where bicycles, pedestrians and neighbors are given priority. There should be ample opportunities for people bicycling and walking to cross busy streets, at least 50 crossing opportunities per hour, with 100 crossing opportunities per hour the preferred level of service. Diversion that is frequent enough that no single side street sees most of the diverted traffic, and so speed bumps are not needed. You might notice there's differing—and sometimes conflicting—opinions on the best solutions. Here’s another way to look at our neighborhood streets. Blue streets are non-neighborhood collector streets that connect at least 2 neighborhood collectors. Here’s how they monitor traffic. You can determine not only vehicle counts, but direction, speed, acceleration, and types of vehicles. Anything not-green is bad and out of spec for a Greenway. 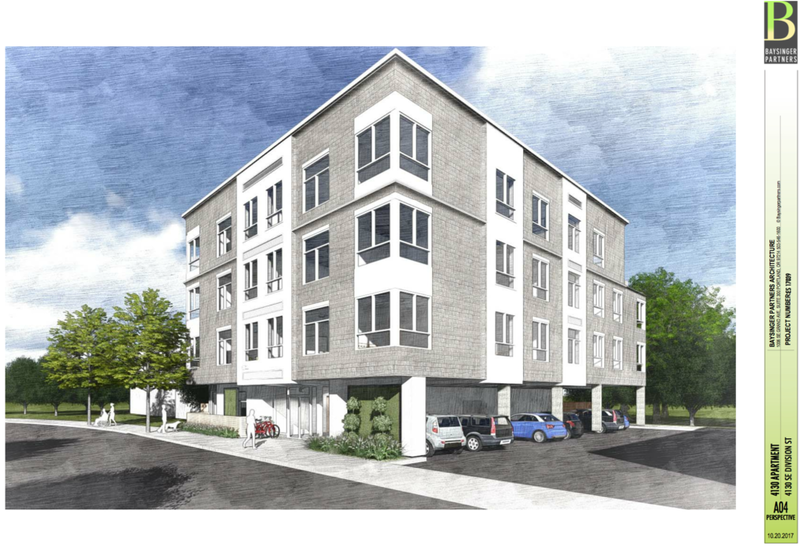 Development: Construction of a 4 story, 19-unit residential, multifamily building. The RNA Land Use & Transportation Committee Chair had a chance to talk about the project with one of the architects, Matthew Lillard. A: Familiarity with the neighborhood and increasing the use potential of land from the current use. A: There is still a very strong demand for housing in the neighborhood and city. Our building provides 19 units, all at two bedrooms. Owners/ developer are providing two bedroom units to fit a missing need in housing as other developers are providing smaller studios to increase rent dollars per square foot. They are providing more generous units to decrease turnover. A: We are providing 8 on-site spaces for our building. There is an additional 3 potential unassigned street spaces in front of our development (the new Trimet bus line may affect these in the future with a stop up the street). Comparable to other recent developments, the developers recognize the parking needs and are providing a high percentage of parking in comparison to the market. While the city does not require any on-site parking for our number of units, we are providing tuck under/covered parking We are also providing interior guest and in-unit bike parking for the residents. Q: You are in a commercially-zoned property. Why are you not building any commercial space as part of your property? A: They are trying to make sure each downstairs unit has an outdoor space and a private space that they the residents can feel ownership. We put the trash area inside the building and are shielding the parking area to provide safe, but attractive storage spaces. The ground floor is a durable brick finish that can be treated with a graffiti coating. We are providing windows onto the street at all levels. 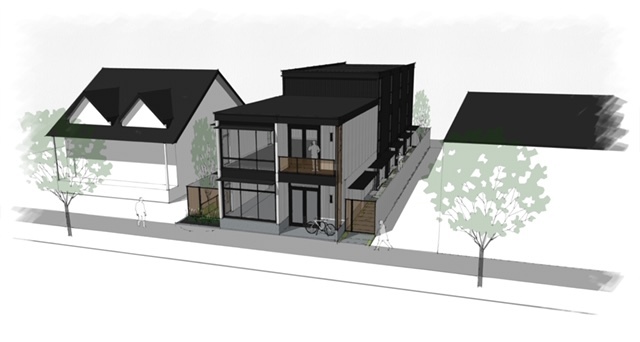 We are a small infill building that provides a good scale and texture to the neighborhood. A: I have not heard of them. A: We are not providing this because it is a small lot and a small number of units. The city recognized the difficulty of managing and financing the inclusionary zoning with smaller lots and excluded smaller developments from this requirement. The project is not removing any existing rental units and is adding to the overall supply of housing. A: The owners/developers are very satisfied with the design and told me they would not change anything. A: I will need to discuss with the contractor first and discuss more when the owners/developers are back in town. I do not envision them utilizing any of the smaller neighborhood streets for any reason. A: Please see the attached. Q: Can you send us floor plans for the building?